DOCK TALK- Karma Yacht Sales Blog:: Spiders on the boat- Tips for getting rid of them and keeping them away. Spiders on the boat- Tips for getting rid of them and keeping them away. If you are like us, the past four weeks have been a constant battle to keep the collection of eight-legged friends from taking over your boat. Many of our concierge clients have asked: "What can you do to get rid of them?" In the delicate ecosphere that is a boat, Spiders are opportunists and seem to multiply by the thousands in dry weather (like we have had as of the last 50 days). The rain spells that we had in July helped the mayfly population explode as well ,which is a natural treat for many of the common boat spiders (aka barn spiders). Enclosed are tips from our experience of owning and caring for boats. While there are many commercially available sprays that will help you part with your money in $8-10 increments, the best method is prevention- That usually starts in the off-season. We like the mothball method combined with the dryer sheet method. Place mothballs in compartments around the boat when you store for the winter. Take a few plastic containers with lids (like the kind chinese take-out come in) filled with mothballs in various areas. The lids come in handy to curtail the smell of the mothballs once you want to use the boat . The dryer sheets in various cabin lockers work wonders too. For some odd reason, our arachnid friends dislike the scent of both of these and won't go near them. Regular washing of the boat and removal of nests and eggs helps a lot. The egg sacs are often filled with microscopic spider-lings which go everywhere. They mature rather quickly in the hot weather we have been having and will be spinning their own web condos in no time if not removed promptly. Don't be surprised if they set up shop from one day to the next even after a thorough cleaning and removal. It seems like a never ending battle at times. The incense method works great internally and on the exterior of the boat. Having the incense smoke directed at the web will draw out the spider and have them bail. At that point, you can evict them or assist them in meeting their maker. Direct your attention to the egg sacs and areas where the nests are located. 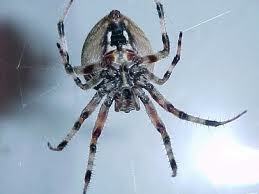 You will have the best success in working towards decreasing your spider population through a strategic approach. Once gone, switch into prevention mode and keep them 'gone' for good. We hope this helps and if we can be of any assistance by adding you to our concierge program, give us a call and we can quote your boat on our services.